Bob Dylan took Latin. I didn’t know this before reading Why Bob Dylan Matters, an insightful reflection on Dylan’s investment and, ultimately, his participation in the Western literary tradition by Richard Thomas. Thomas has been publishing scholarly articles on Dylan for over a decade and has taught a Harvard freshman seminar on the songwriter every four years since 2004, but it is because of his day job that I mention Dylan’s exposure to classical languages—Thomas is the George Martin Lane Professor of the Classics at Harvard, known within the field as a leading literary critical voice on Virgil and intertextual poetics. Dylanologist Thomas joins forces with Classicist Thomas in this book, elucidating Blonde on Blonde through the Aeneid, drawing parallels between Modern Times and ancient times. The result is suggestive, quite often illuminating. It would not be an overstatement to say that what we have here is as much a book about Dylan’s literary significance in the twenty-first century as one about the continued significance of Virgil—or Homer or Sappho or Catullus or any of the other classical poets Thomas discusses. To continue, Bob Dylan took Latin at Hibbing High School for some number of years between 1955 and 1959. He also participated in the Latin Club during his sophomore year. Dylan biographer Anthony Scaduto does not mention this detail. Neither does Dennis McDougal, Howard Sounes or, I would guess, most of Dylan’s biographers. (Toby Thompson mentions it in his 1971 Positively Main Street, incredulous.) But for Thomas these details play a key role. A main reason why Dylan matters, for Thomas, is because he wants to place, and is largely successful in placing, the songwriter in a literary tradition that runs from Homer and Sappho straight through to the present, with significant stops along the way for the Latin poets. The earlier Thomas can establish Dylan’s classics bona fides the better. Thomas’s career has in large part helped define the Hellenistic bent of the Latin poets, in particular the Augustan poets and, above all, Virgil. The Hellenistic Greek poets, primarily those of third-century BCE Alexandria, like Callimachus and Theocritus, developed a notoriety for their literary style. Bookish, deeply allusive, and highly self-conscious about their bookishly deep allusivity, the Alexandrians set the standard for literary taste that Virgil and his contemporaries inherited. By this standard, Dylan is the perfect modern subject for Thomas’s literary critical style. As a poet, Dylan is a modern-day Alexandrian with a breadcrumb trail of literary influences wending through over five decades of song lyrics, memoirs, and interviews. Woody Guthrie, Hank Williams, Blake, Rimbaud, Whitman, and Shakespeare make regular appearances. As do Byron, Shelley, Longfellow, Poe, Thucydides, Sophocles, Tacitus, Suetonius, Ovid, Dante, Machiavelli, Milton, Gogol, Balzac, Maupassant, Hugo, Dickens, Freud, Rousseau, in a dizzying recapitulation of Dylan’s own account—part memoir, part self-mythologizing—of the library in the New York apartment where he lived in 1961. (What a classicist would give to have a catalog—even a dubious, self-consciously misreported catalog—of Virgil’s books at twenty years old!) Kipling, Shaw, Mann, Buck, Camus, Hemingway all make appearances in Dylan’s acceptance speech for the 2016 Nobel Prize in Literature. It is the literary critic’s challenge to make sense of it all and Thomas does an admirable job. But it is a particular pleasure to follow Thomas as he explicates Dylan’s tight patterns of quotation and adaptation of Ovid’s exile poetry on the 2006 album Modern Times. In this section, the highlight of the book, and the section that best conforms to the intertextuality-obsessed Latin literary criticism that has defined Thomas’s career in classics, he recounts the discovery by New Zealand poet Cliﬀ Fell of numerous quotations among the album’s lyrics. Fell noticed that Dylan borrowed liberally from Peter Green’s translation of Ovid’s Tristia and Letters from the Black Sea. Thomas presents the poetic evidence side-by-side—Dylan in column A, Ovid/Green in column B, lexical echoes on display—and, as he does in his best scholarship on classical poetry, for example his commentaries on Virgil’s Georgics, he homes in on his subject’s talent for selecting, reworking, and deploying snatches of literary antecedents. Since Ovid was no intertextual slouch himself, a millennia-old proto-Dylan, happy to adapt, transform, and even distort material from the songs he heard growing up, Thomas’s method has a lot to teach readers about how to read both sides of the allusive game. In this respect, the key chapter is the seventh on Virgil. This chapter begins with an epigraph, T. S. Eliot’s famous quotation on literary appropriation: “Immature poets borrow; mature poets steal.” But it is a sentence from a bit further down in this passage that truly hits the mark: “A good poet will usually borrow from authors remote in time, or alien in language, or diverse in interest.” Thomas has a knack for drawing out aﬃnities across these divides. A good example shows up in parallel defenses against literary theft between the Mantuan and the Minnesotan. On one side, Virgil rebuts Asconius Pedianus’s charge that there is a bit too much Homer in the Aeneid with the words: “Why don’t they try the same thefts? If they do they’ll find out it’s easier to steal Hercules’ club.” On the other, confronted with verbatim borrowings from Confederate poet Henry Timrod, Dylan pushes back against Rolling Stone’s Mikal Gilmore in a similar fashion: “If you think it is so easy to quote him and it can help your song, do it yourself and see how far you get.” Thomas defends the coincidence—a critical leap, both historical and literary—as “independent glimpses into how the intertextual process works, in any place and time.” It is speculative, suggestive, but, at the same time, persuasive. More significant, in the context of the book, by adducing examples from Suetonius and Tacitus alongside contemporary rock critics, Thomas bolsters his project with an eﬀective dose of nihil sub sole novum. Classics was as classics is as classics will be. The attempt to collapse the distance between literature then and literature now is central to the book and Thomas moves easily between classics criticism and rock criticism. The book’s bibliography features both Robert Fagles and Greil Marcus; “Café Wha?” follows “Caesar, Julius” in the index. Thomas uses the phrase “mountains of the past” to refer to both Ovid and Frank Sinatra. Occasionally, the juxtaposition jars. This is the only book I can think of that could get away with comparing tailgaters outside a stadium concert with the “itinerant lyre players of ancient Greece.” But in general Thomas adeptly narrows the chronological gap and he is particularly persuasive in a section called “When a Popular Song Becomes a Classic.” Here Thomas blurs artistic roles: Dylan is the “mature poet,” Virgil “a rock star in his time.” This rhetorical move is an important part of Why Bob Dylan Matters’s most striking contribution. It is not that—or it is not exclusively that—classics somehow lends authority to a modern musician-poet’s artistic program but that Dylan opens up classics to renewal and reinvigoration. “Every classic starts out as popular,” writes Thomas “It is read, viewed, and heard by the people, because its music, words, or images touch something in us, express universals that are profoundly meaningful.“ The book is at its best when Thomas expounds on these poetic universals whether the original medium was stone, papyrus, or 2-inch reel-to-reel magnetic tape. Still, Virgil did live over two thousand years ago. His life is poorly documented—a few comments from contemporaries like Horace and Propertius, a tombstone epigraph, a biography that leaves as many holes as it fills. A literary critic working on Virgil can be granted a fair amount of license with such details. With Dylan, however, the situation is reversed. We know a lot about his life and times. So, when Thomas reaches into his classics-honed critical toolbelt to discuss literary history, it can be frustrating for the reader. For example, on the romantic relationship with girlfriend Suze Rotolo described in 1964’s “Boots of Spanish Leather,” Thomas writes: “She was the Muse who gave him that song, but the song that Dylan created from that reality is the same even if we know nothing of the circumstances of its composition, even if the reality did not exist.” This may work for Catullus and Lesbia—two bare historical sketches about whom basically “we know nothing.” But again we know a lot about Dylan and we also know a lot about Rotolo. We have the songs, but we also have, say, her 384-page memoir from 2008. Imagine if Rotolo’s Wikipedia article was written only using biographical inferences from “One Too Many Mornings” and a half dozen other Dylan songs and you get a sense of the limitations of a classical approach to literary history applied to contemporary poetry. Unlike Catullus, Bob Dylan is still alive and touring. So we could also ask the poet himself. Or could we? As we learn again and again in Why Bob Dylan Matters, the man is an enigma. His interviews—Thomas calls them “fifty-five years’ worth of creative control and orchestration of the image and information he has permitted the world to possess.” Dylan’s memoir, Chronicles: Volume One—Thomas calls it “not a biography in any sense of the word.” Dylan is like the Delphic oracle, only more diﬃcult to interpret. So, while Thomas’s book is also not a biography, details of Dylan’s life of course play a central role, and so the aporetic nature of a comment like “No one can really know who Bob Dylan is” can leave the reader unsatisfied. It should also be said that Dylan’s lyrics can be just as puzzling as his persona and Thomas handles this well overall. But at times Dylan’s reading of the Western canon is fragmented and imagistic to an almost absurd degree and the listener, even a deeply informed listener like Thomas, can only be expected to extract so much meaning. Confronted, for example, with the cast of characters from “Desolation Row”—Cinderella, Bette Davis, Romeo, Cain, Abel, the hunchback of Notre Dame, the Good Samaritan, Ophelia, Noah, Einstein, Robin Hood, Dr. Filth, the Phantom of the Opera, Casanova, Nero, Neptune, Ezra Pound, T. S. Eliot—what is the critic to do? It’s like bringing a hermeneutic knife to a surrealist gunfight. So, while Thomas argues persuasively that literature from Homer forward provides raw materials for Dylan’s imagination, analysis has its limits. Like Aeneas embracing Dido in the underworld, at a certain point the desire to make sense of it all is overwhelming, even though there is not much solid to grasp hold of. In his chapter on Virgil, Thomas writes that “the classic text is something that sticks around, that outlasts its moment.” By this standard, Dylan is trending toward “classic,” a word which is not entirely unproblematic. As music critic Alex Ross said, when people hear “classical,” they think “dead.” “Classics” as a genre has more or less been retrojected onto a mass of works—dead-language literature, as some would have it—connected merely by the fact that they are old, or better yet that they are not new. They have stuck around. “Classic rock” as a radio format, arguably the radio format which best suits Dylan, is much the same: not exactly dead, but definitely not alive. Both labels find themselves at the intersection of greatest hits and nostalgia. 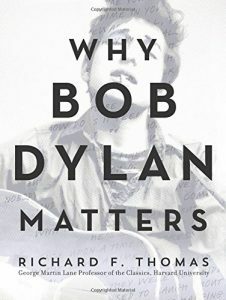 To Thomas’s credit, as a scholar of both classics and classic rock, he manages in Why Bob Dylan Matters to subvert the nostalgic side of both. Dylan deserves to be heard not as a throwback, but as a strong voice in a lyric tradition dating back millennia. More unexpectedly perhaps, or at least not specifically advertised in the book’s title, he makes the same strong case for a number of Ancient Greek and Latin poets. Homer and company deserve to be read not because of some sort of ancient scriptural authority, but because they speak directly to our times, at least our times as reflected in a contemporary voice like Dylan. Thomas is an academic who ought to know, and since the Nobel is likely to usher in a golden age of literary criticism on Dylan’s works, he provides a tantalizing glimpse of what this critical reaction could look like. He is not alone. Thomas calls attention in the book to the work of other Dylan scholars, some of whom have taken up similar studies of Dylan and the Bible (Michael J. Gilmour) and Dylan and Shakespeare (Christopher Ricks). Thomas oﬀers here the introduction to the influence of Greek and Roman authors on a major American poet, identifying significant traces of the classical tradition in his music and lyrics. “The old is still happening while the new enters the scene, sometimes unnoticed,” Dylan once told an interviewer. But Thomas does notice, and he has noticed both the old and the new. As Dylan sings on “When I Paint My Masterpiece,” ancient footprints are everywhere. In making a compelling case for why Dylan matters, he has made an equally compelling case that the vestiges of classical literature that fill his works matter as well. Patrick J. Burns works as a Classics researcher in New York City. He writes about Latin and digital philology on Twitter at @diyclassics.